Edwards Flight Test Museum prepares to launch! 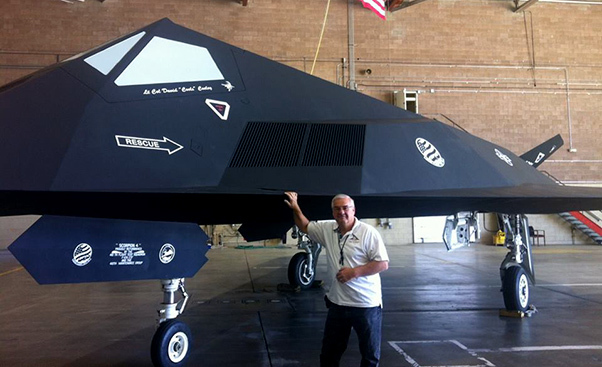 George Welch flight test museum director and all around super guy! As I’m looking forward to the ground breaking of the new Air Force Flight Test Museum next week, I thought it would be a good time to head out to Edwards and see what my good friends George Welsh and Tony Moore could share with me about the new facility that many in the aviation world are waiting for with great anticipation. This morning, the drive across the lake bed from Rosamond brought back a flood of memories from the decades of my family’s involvement at Edwards and I looked forward to seeing the old stomping grounds again. Pulling up to the museum and seeing the static aircraft displays sitting outside, it made me think back to the days when the monuments to man’s quest to fly were alive and breathing in the skies over the Antelope Valley! Stepping out of my trusty old SUV, my ears were immediately met with the sounds of flight test in action. A quick glance to the skies took me back to the days when every front line fighter or bomber would test the limits of their design with the skilled legends of flight test at the controls. 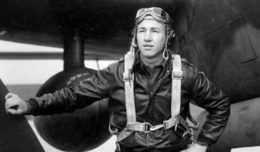 Many of us remember those famous names, but we must also remember the names of those who were a part of the effort, in the shadows, but just as important—and that’s the importance of a museum. 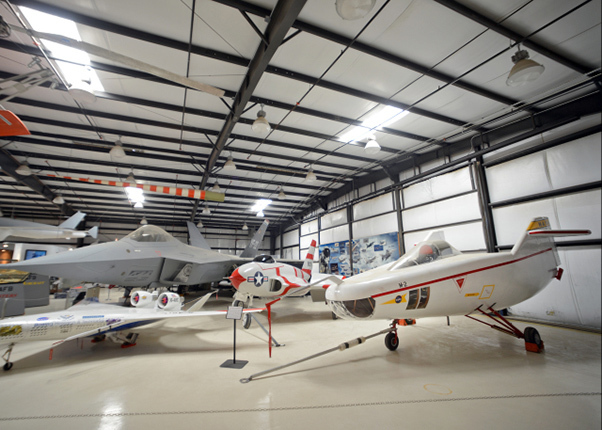 Walking into the flight test museum, the general public and the aviation fans experience the place where these names live on, and are on full display for those who carry the passion for the amazing journey of Muroc, Edwards, the men and women and of course, the aircraft. Spending the day with George and his team, as they shared their excitement about the future of the museum, I was given a preview of the vision for the new facility—a place where the past mission and history of flight test will be merged with a modern vision of the purpose and function of a museum. Many of us have fond memories of the aircraft museums of old, where we would look at artifacts and displays in cases and cabinets, or walk among the retired aircraft in outside settings, with those winged wonders looking a bit helpless bolted down to the ground. These experiences served us well for many generations, but like the days of biplanes of yesteryear, today’s generation of museum goers are not content with static displays. They want to take the old biplane and push it into the age of high performance jets and space travel interaction! I’m excited when I hear from George and his staff that’s pretty much the experience that you will be entertained and inspired with! 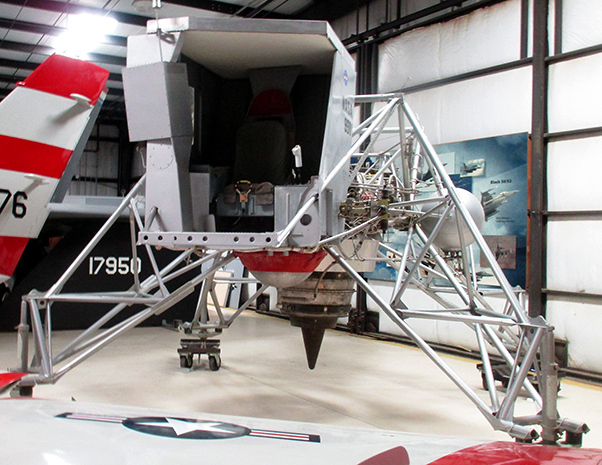 NASA Apollo Lunar lander test vehicle. There were two points I took away from that meeting. First, the aircraft displays at the Air Force Flight Test Museum will be directly connected to Muroc/Edwards-related aircraft. Each aircraft represents a significant contribution to the advancement of flight that took place at the base. The story lines tell the history of each aircraft’s failures or successes that went on to making it a viable design concept—or not. The goal of this museum is to be a place that does not just park planes for the sake of having an aircraft to look at, but to present displays and activities that speak to the mission of Edwards over the decades, and that is something I’m really looking forward to! The second aspect of the museum is something that is really going to be great, not only for the museum, but for our community as well! 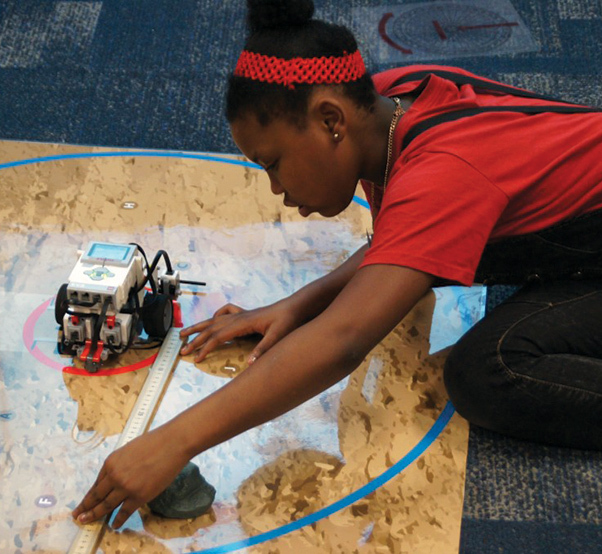 DOD STARBASE is a program concept that has been around since 1991 and has given young people the chance to spark the imagination and learn the fundamentals of a good STEM education, with high tech teaching tools and displays. These not only draw the students in, but make it easy for them to see firsthand how scientific concepts in the world of aerospace are applied and how they work. The Flight Test Museum at Edwards Air Force Base, Calif. The museum is partnering with STARBASE to provide local elementary students, primarily at the 5th grade level, a week-long experience at the museum, with instructors and teachers who are actually a part of ongoing aircraft development at Edwards, with strong backgrounds in science and technology. Student will attend from area schools, along with teachers, and the programs at will be an extension of the program at the new Flight Test Museum. The program can inspire young people to gain the knowledge that will better prepare him or her for greater things in life by giving them the opportunity to fail, try again and succeed and then understand the concepts of how and why things in the world of science and technology work the way they do. Best of all, in this type of learning environment, students will be hard pressed to say school is boring and uninspiring! The thought of six-hours a day, for five days, at Edwards Air Force Base even makes me wish to be that age again! These are just a couple of highlights I learned of today on my journey to the Edwards Museum. Many more great projects are in store as the museum continues to grow over the years. As a guy who has seen Edwards from the 1950s on, I can’t wait to see the shovels of dirt turn over and the journey begin, to the completion of Phase One, when it’s doors will open to the public for the first time. In the world of flight test, the old is used to understand the principles of the future. When it comes to this museum, that same philosophy is evident in the leadership by making sure the old is used to inspire those in the future! It’s been a long time coming and all I can say is, let’s light this candle and make it so! Congratulations to all those who had the dream and never gave up over all these years, your efforts will live on for generations! For now, its Bob out — and I look forward to sharing more Hanger flying stories with you in the next issue!